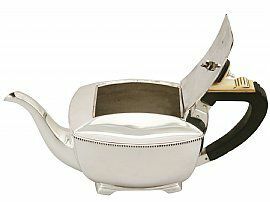 This exceptional vintage Elizabeth II sterling silver four piece tea and coffee service/set consists of a coffee jug, teapot, cream jug and sugar bowl. 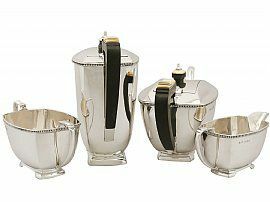 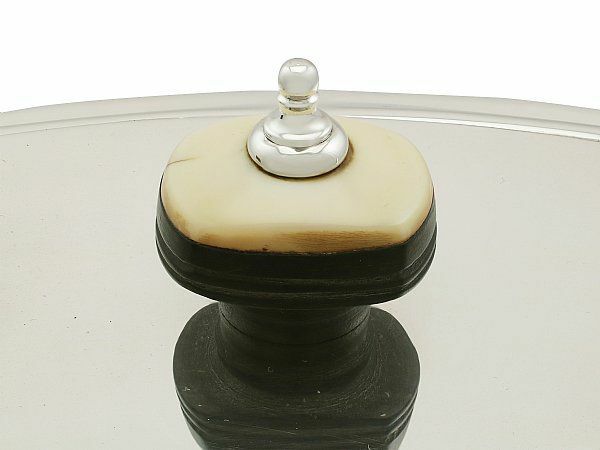 The pieces of this vintage tea service have a plain rectangular rounded form onto a collet frame with integrated stepped bracket style feet, all in the iconic Art Deco style. 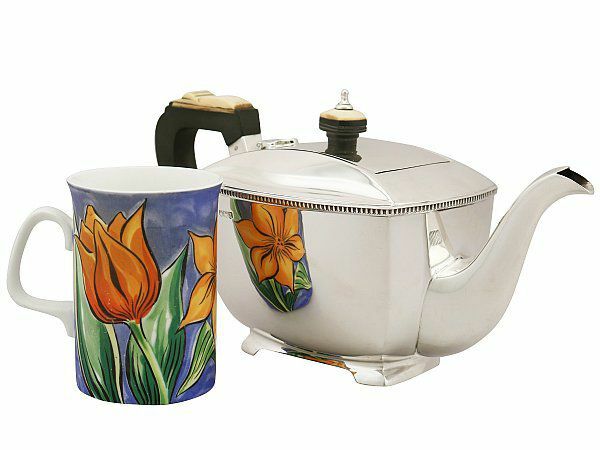 The surface of each piece is plain and embellished with an impressive applied egg decorated border to the upper portion. The coffee jug and teapot are fitted with plain subtly domed hinged hallmarked covers, surmounted with the original iconic Art Deco style carved painted wood, ivory and sterling silver finials, securing to the interior with a wing nut. 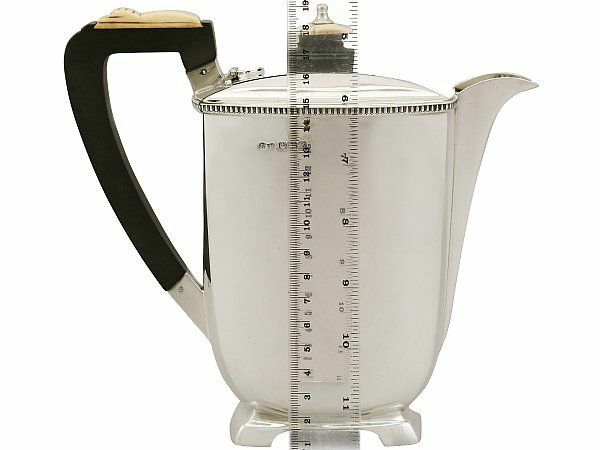 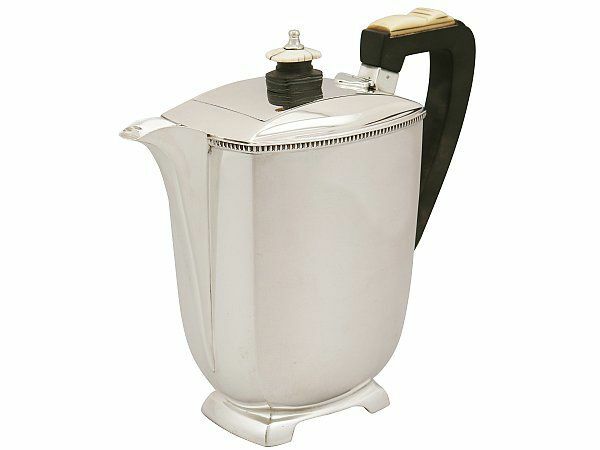 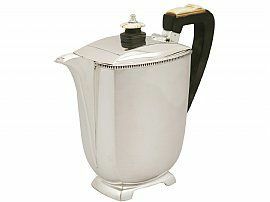 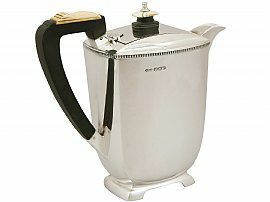 The teapot and coffee jug retain the original fine and impressive angular C shaped carved wood handles incorporating an unusual inset ivory thumbpiece, all in the Art Deco style. 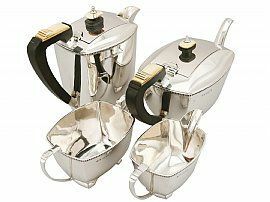 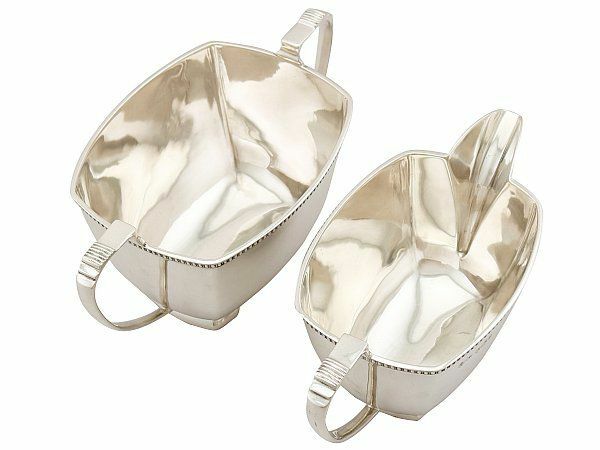 The cream jug and sugar bowl are fitted with C shaped sterling silver handles incorporating stepped thumbpieces; matching the design of the coffee pot and teapot handles. 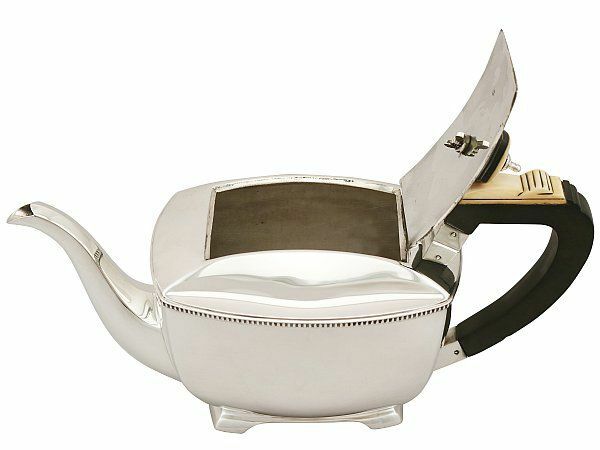 The teapot is fitted with a fine and plain swan necked spout. 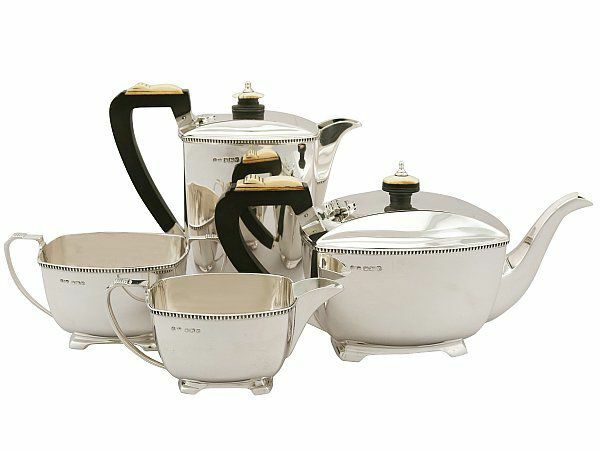 This vintage tea service is an exceptional gauge of silver, exceptional quality and in excellent condition. 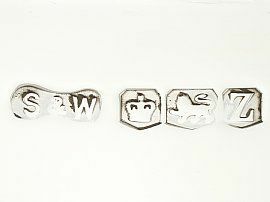 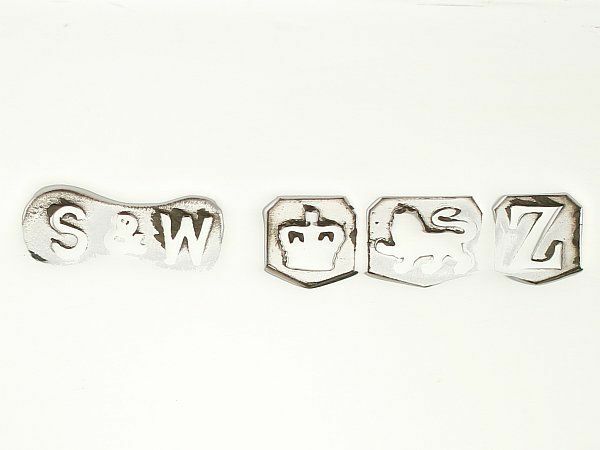 Full hallmarks struck to the surface of each piece and part hallmarks to the interior of the covers are all very clear. 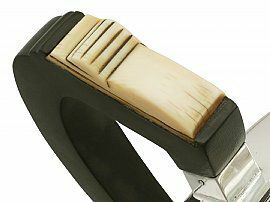 Length from back of handle to tip of lip 20.7cm/8.1"
Height to top of handle 8.8cm/3.5"
Length from back of handle to tip of lip 16cm/6.3"